Vegetable-tanned cow leather (approx. 2.2-2.5 mm thick), nickel-coated steel fittings. Unlined. Adjustable strap, width 2.9 cm, length 1.15-1.37, width 41 cm, height 32 cm, depth 11 cm. Weight 2.1 kg. Withstands the Rigours of Everyday Life. Briefcase Made of Leather from the Neck of the Cow. Of all the parts of a cow's skin, it is the neck that produces the most robust leather. This is the result of the constant movement and changing tension to which this part of the skin is exposed – something that has a direct impact on the structure of the fibres. 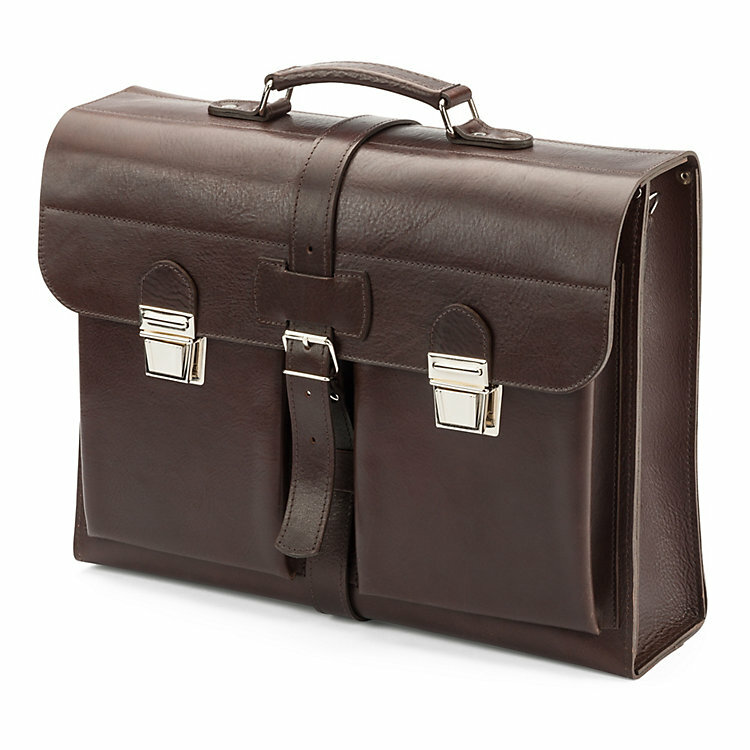 Our Westphalia-based manufacturer, a specialist in bags and cases for industry and public authorities, uses vegetable-tanned neck leather from French cattle to produce this briefcase. Its design with two sewn-on front pockets and surrounding, adjustable closure strap is inspired by classic briefcases from the 1930s to 1960s. The capacious inner compartment is divided by a leather organiser panel, the bottom and both front pockets are reinforced. The bag acquires its dark brown colour from vat dyeing with high-quality oils which leave the surface open-pored and the leather structure visible. This means that some parts of the leather are strongly grained, others are smoother. The stitched raw edges are buffed, polished and dyed. The bag can also be carried on the shoulders, for example, when cycling, using the detachable, adjustable strap.